My grand plan is to install a modern kitchen in the Faraja Centre to expand services to the whole community. We share a vision to offer a variety of meals, using the healthy produce grown in this fertile region, to the vulnerable children who converge on the centre every Saturday for a basic meal of beans and rice, stories, songs and ball games and lavish doses of nurturing from Mama and Pastor Garama. Mama Millicent, an experienced health worker, and her loving husband are passionately devoted to improving the quality of life for families throughout Chogoria, a vibrant market town set in the heart of the lush farmlands of Tharaka-Nithi in the foothills of Mount Kenya. 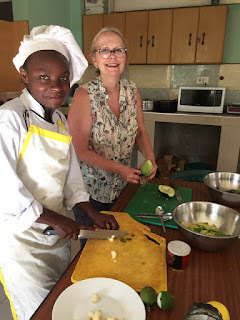 On my arrival we brainstorm without limits, imagining teaching cooking and nutrition classes to the local ladies, holding Pizza Nights for the youth, Mums and Babies get-togethers, Movie Nights, Family Events, Men’s Fellowship, all sorts of training workshops and so much more. We are tingling with excitement at the possibilities that a new kitchen will unleash! So anyway I have some guys from a Kitchen Company in Nairobi travel four hours by matatu (public bus) to draw up a design and give us a quote on the project. When I get the email, my heart sinks! The design is impressive but not exactly what we’d asked for and the quote is way too high! I realise the process of communicating clearly and negotiating in the planning stage is going to take much longer than my four-week stay! 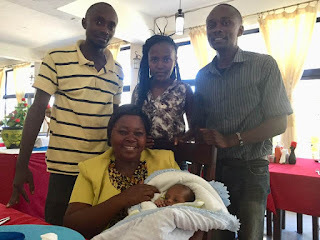 Another round-table meeting with Millicent and Garama and board members and we agree to go “pole pole” – that’s Swahili for ‘”slowly slowly”. 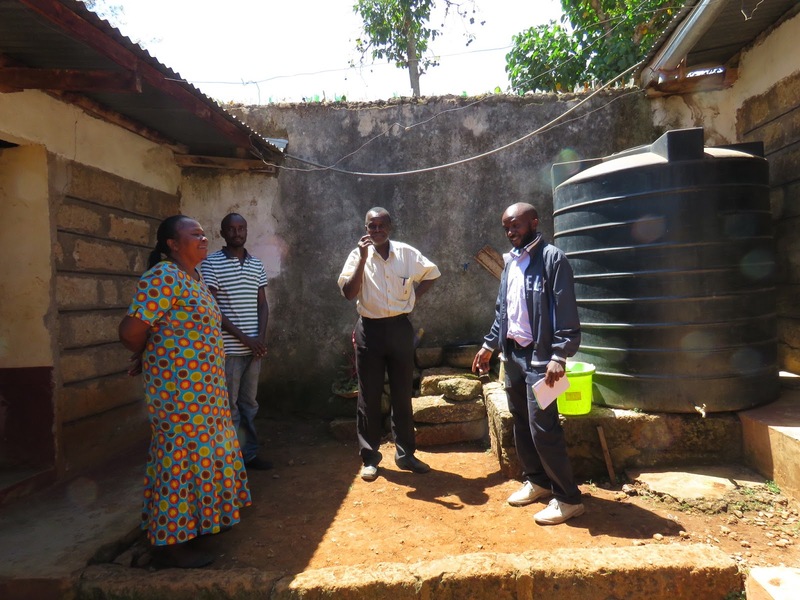 I decide to return later in the year for a three-month stay to help with installing the kitchen, an extra water tank and filter system and new electrical wiring. 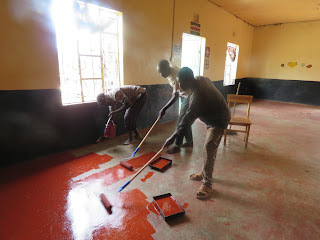 Meantime we tackle the task of repainting the floor and courtyard in the beautiful rust-red colour of the earth. Garama, with the help of son Peter and young Silas, quickly transform the place in the first stage of the Faraja Community Centre makeover! I am staying at the delightful Snow Peak, an unlikely name for a hotel surrounded by a leafy tropical garden of towering palm trees, exotic ginger plants and pretty purple bougainvillea, a tinkling stream and sweet singing birds. 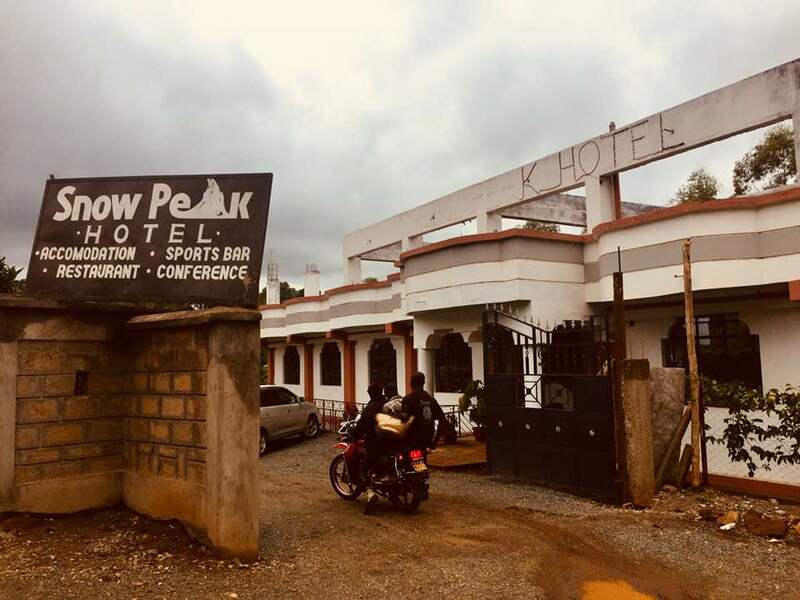 The locals proudly explain that when you look up you can glimpse the snow-capped peak of majestic Mount Kenya! You know the feeling when you stay at a hotel so long it feels like a second home? 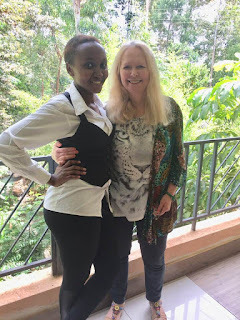 Well I sure have settled in to a pleasant routine of a leisurely breakfast on the tranquil balcony while trying Kenyan dishes and making new friends. The owners of the newly opened hotel, the lovely Mr and Mrs Njeru are making me so welcome! 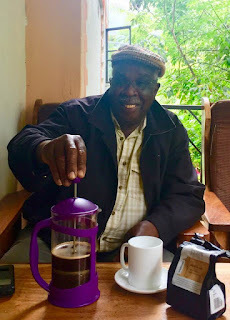 Justin Njeru Ng’entu is also a coffee farmer with a depth of knowledge about the region’s history and he regales me with entertaining stories of the colonial past. Under British rule it was illegal for local farmers to grind and drink their own high quality coffee, which was seized for export at massive profits for the Brits, while farmers were paid very little. In an ironic twist of fate, I had bought a packet of Mount Kenyan coffee in Waitrose in the UK and gave it to Justin along with a coffee plunger as a gift. So we sit together savouring the aromatic coffee and dreaming up ways he can sell his superb coffee direct to the public! Garama has also discovered “London Tea” (in preference to weak milky African-style tea) and is enjoying the ritual of taking strong tea mid-morning and afternoon with biscuits! This is a new vice he can blame on me! 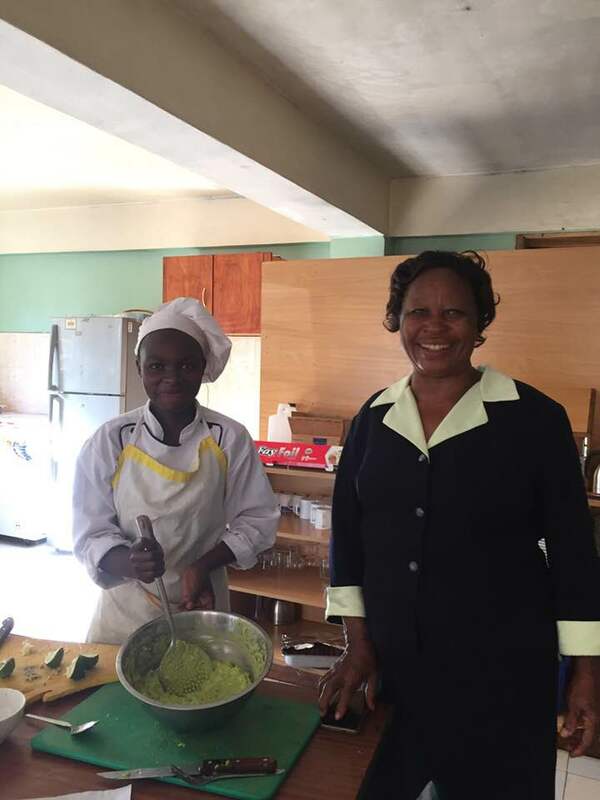 I buy huge ripe avocados for a few shillings in the market and make guacamole with Sylvia and Joy. The avo’s in this fertile paradise are so plentiful they fall on the ground to be eaten by happy pigs! 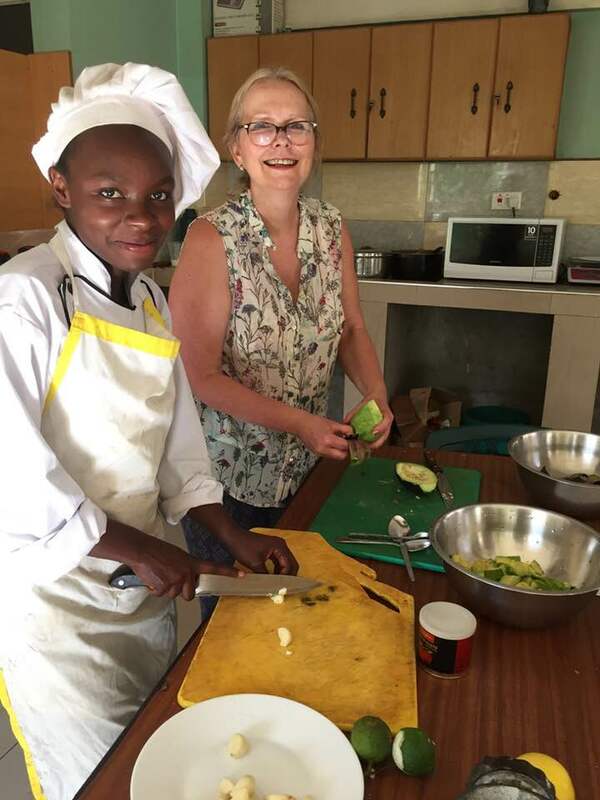 Mash them up with salt, garlic, chilli and lemon and serve with African-style chapati and suddenly the locals are discovering why avocados are so popular in other countries! I love this cross-cultural exchange! 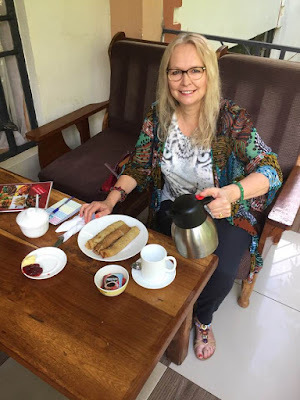 My favourite Kenyan dishes are vegetable samosas, Bhajia, which are deep fried scalloped potatoes with coriander, and Spicy Cowpea Curry. The young staff – Peter the waiter, Peter the intern, whom I witness blossoming in confidence, the pretty girls; Linda, Magdalene, Joy, Maureen and Wilson, Oscar and Johnstone in the kitchen, Dickson in the bar and Rose and Paul, who every day meticulously mop and polish the floors, are all so friendly and amused by my accent and my funny ways! But when I meet Kuka I believe I’ve met my African “twin”. We are so alike with our shared backgrounds in media, politics and psychology, with our secret passions for romantic movies and country music, we hit it off and can’t stop talking for hours! 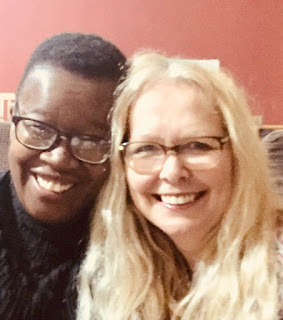 Kuka already has a real twin sister, Kuki, so I accept the role of “imposter twin” and we laugh at how similar we look for “twins”, comparing our chocolate and vanilla skin! In the restaurant after a huge lunch with Kuka and American friend Ree’L, I am texting, when I look up to see this larger-than-life character sporting an Akubra hat and floral shirt! Micheu Obadiah is a genuine one-off! He loves to play his guitar and sing and we immediately burst into old songs; Leonard Cohen, Bob Dylan, Elton John, the Seekers! Like, who would believe I’d find someone in Kenya who knows every word of ‘Another You’! It’s an unusual way to meet someone but life’s too short to waste an opportunity to sing! So we sing together in the restaurant and the young ones are now convinced I am quite mad! I’m planning to bring my guitar next time so Obadiah and I can strum and sing around the campfire! 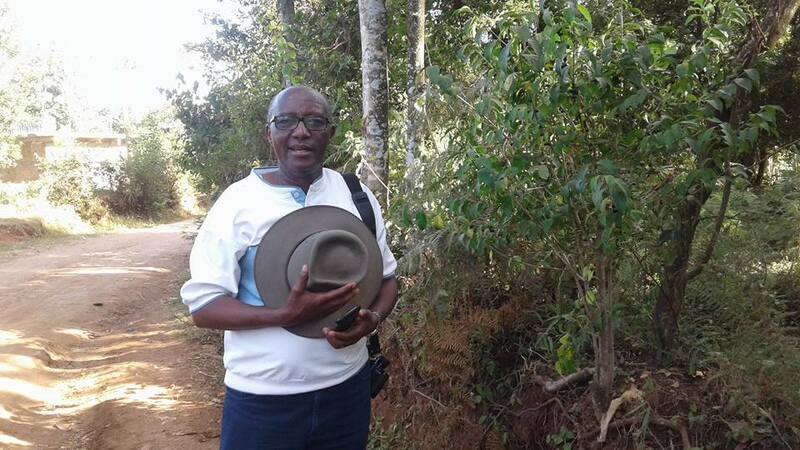 I discover, on an impromptu nature walk that Obadiah is also an expert on medicinal plants of East Africa and a keen bird watcher, who can mimic the beautiful calls of all the local species! And so I meet Larry, a rugged Texan paramedic, who is doing a vital project setting up emergency services for villages in the remote areas of Kenya. He shares stories of life in the spectacular scorching desert of his home state, adventures in the Mexican wilderness, working in Yellowstone National Park, and setting up medical services in poor countries all over the world. 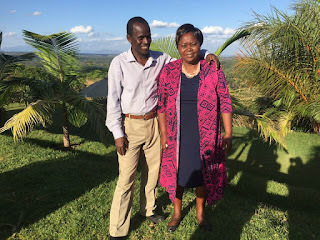 And there’s James, a Kenyan man who has returned home after living more than 20 years in the UK, and is now embarking on an innovative farming project with 30 families. And there’s Alpha, a social worker who has worked with charities and NGO’s all over Africa. I’ve become good friends with the Garama brothers, Peter who is the proud new dad of baby Oliver with his beautiful partner Purity and Eliud who is training in community development work with his mum and her team. Millicent has become my Kenyan sister. She has so much wisdom and strength and exudes empathy and bubbles with laughter. 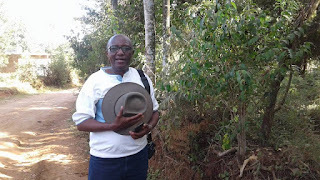 Pastor Garama is my Kenyan brother, so protective, caring and kind. I feel loved-up and connected to my network of new friends while strengthening my bond with Facebook friends and followers in this cross-cultural immersion. I’m becoming a local. 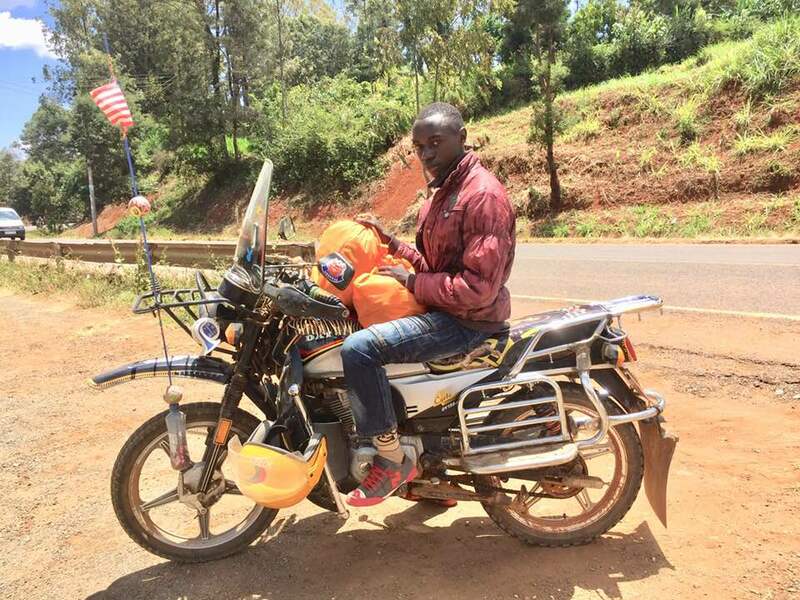 I know this because after a trip to the colourful, bustling markets, laden down with bags of bananas, mangoes and peanut butter and African fabric, I jump on the back of a ‘Boda-Boda’ motor bike and whiz along the road, with my blonde hair flying in the breeze and the locals laughing at the Old Lady ‘Muzungu’ (white person). 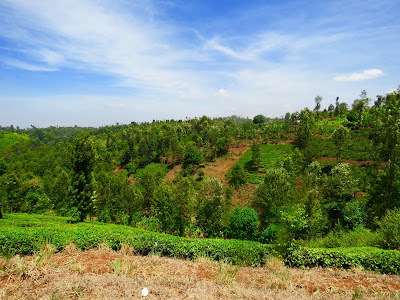 One day we pile in the van with Peter and Purity nursing baby Oliver and grandma Millicent beaming with pride in the back with Eliud capably behind the wheel and me in the passenger seat gazing out at the spectacular rolling hills as we head for Meru. Only problem is traffic is gridlocked approaching the bustling town and we sit and sweat for over an hour, crawling along inch by inch. 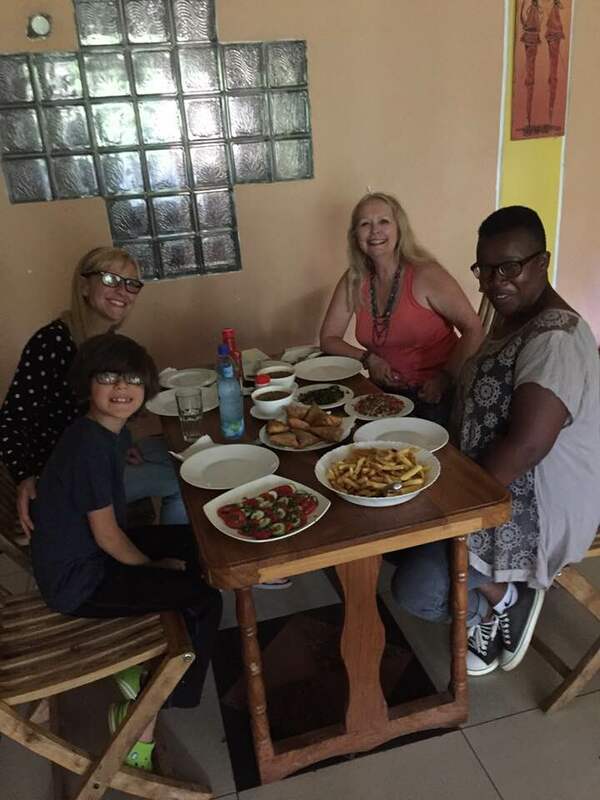 But ‘Hakuna Matata’ we eventually arrive and have lunch. 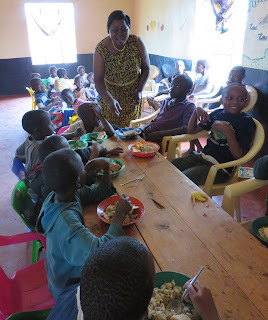 The meals take over an hour to emerge from the kitchen because all food is prepared from scratch. 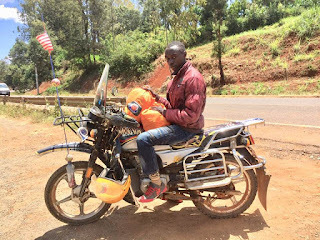 I’m learning that patience is part of Kenyan life! So we hit Tuskys department store and buy up a whole lot of baby stuff for little Oliver who sleeps his way through the whole hot and steamy shopping expedition! And we also buy the paint and rollers and poles for the floor painting job! 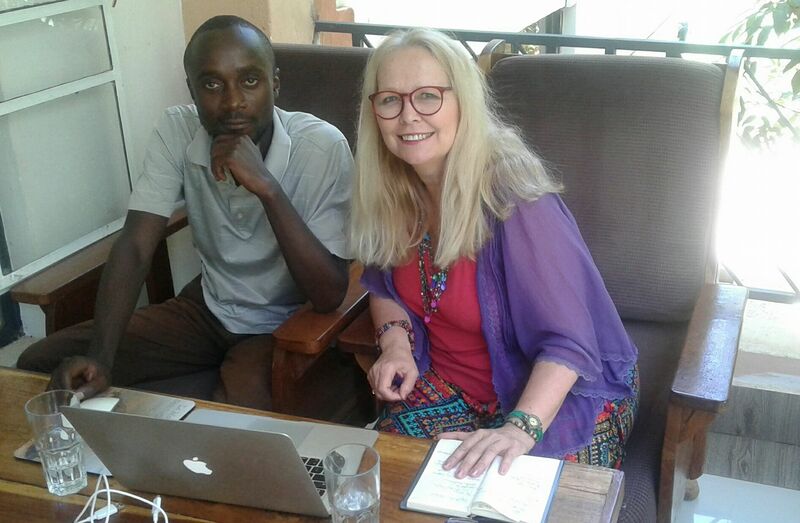 And Peter and I are working together to create a Faraja Facebook Page and enrich the Faraja website to build a following of international supporters and encourage visitors to this beautiful region. I’m starting to get to know the little kids as individuals. The tiny pretty little girls whose big brown eyes and dazzling smiles light up the room and the lanky teenage boys who can kick a soccer ball with incredible force! 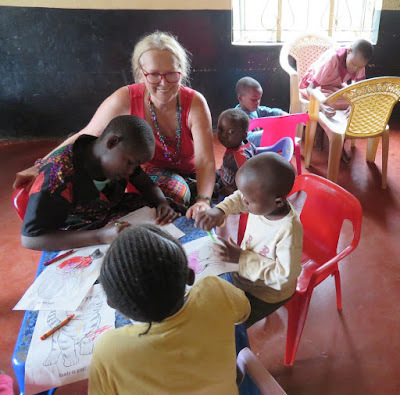 The children have a little party with bread and crisps and bananas as extras on their beans and rice and then we spend ages playing ball games, colouring with crayons and having stories and singing Swahili songs. The rainy season has come early. During the Faraja “Kids’ Club” a torrential downpour drenches the courtyard within minutes and the thundering noise on the roof makes me a little frightened. However the heavy rains stops just as quickly and the brilliant green vegetation sparkles and the air is fresh and fragrant. And no one back at the hotel is worried when the power goes out and we’re plunged into darkness! Hakuna Matata. I go to bed with my Spotify country music playlists and when I wake up the power is back on. I’ve lived for 20 years in the sub-tropics of south east Queensland, Australia where the sweltering humidity over summer makes you pour with sweat 24/7 and the relentless sun gives you a permanent squint and you burn your feet on the scorching sand trying to dash to the ocean. I’ve lived for almost 10 years in the UK where the bleak winters make you hibernate indoors with a case of SAD (Seasonal Affective Disorder) or risk a frost-bitten nose on a rugged-up walk through the eerie bare trees of the muddy woodlands with your shivering dogs. 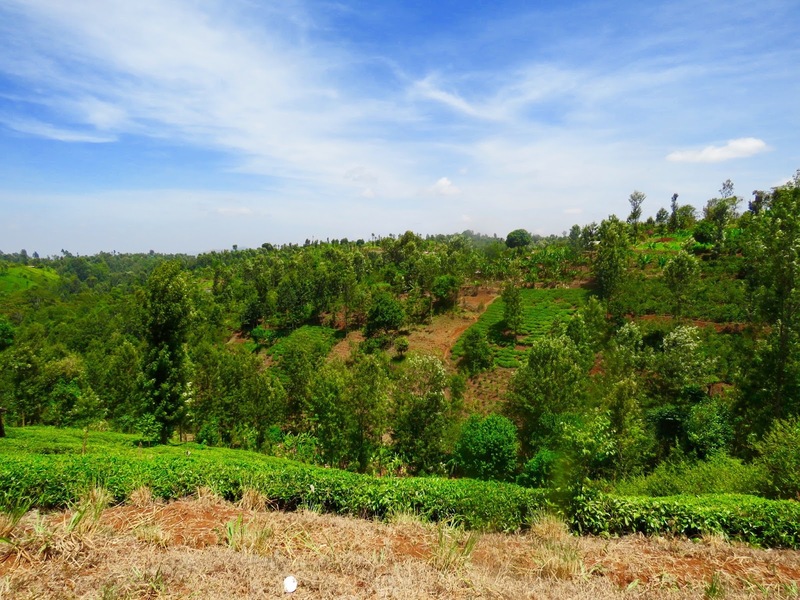 So while Chogoria is close to the equator, the high altitude means the climate is ideal boasting pure hot days and clear blue skies with cool evenings and cool mornings so you can snuggle up and sleep without raising a sweat! Like Goldilocks, I’ve found the perfect middle ground – not too hot, not too cold – just right! 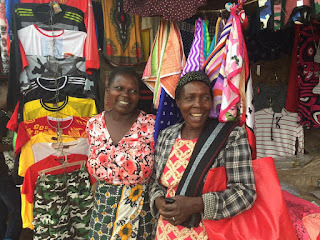 “Asante sana” - Thank you very much! I’ve given myself a Kenyan name, ‘Diani’ after the idyllic beach near Mombasa. This forever-young hippy feels right at home in rural Kenya – a beautiful place with a cast of character and a purposeful project to keep me busy.